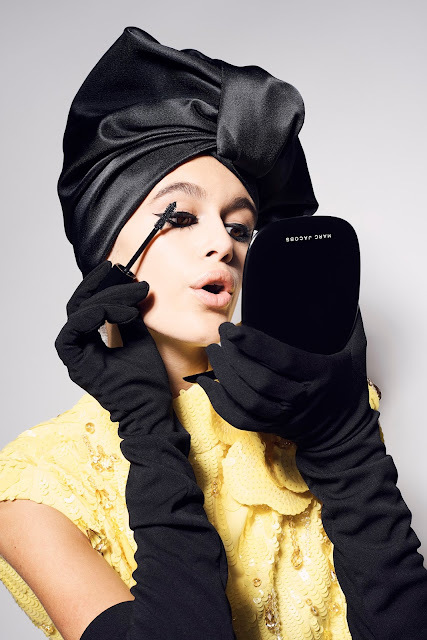 Marc Jacob beauty launches a new campaign featuring Kaia Gerber for the brand's new velvet noir major volume mascara, the images will appear in 50,000 special subscriber issues of vogue's march 2018 issue. A second set of images from the shoot will be released later this spring with a focus on marc jacobs beauty fragrance. Taken backstage at the marc jacobs spring/summer 2018 runway show in september 2017, Kaia wears the yellow finale gown with a black satin turban from the spring collection, with makeup by diane kendal featuring velvet noir major volume mascara. images were shot by Liz Collins and styled by Elissa Santisi, with creative direction by Katie Gand hair by Guido Palau. Kaia Gerber joined Marc Jacobs Beauty in spring 2017, and is among iconic women such as Jessica Lange, Edie Campbell, Winona Ryder,Aaya Jones, and Adwoa Aboah, who have previously and/or continue to serve as faces of the brand. Marc Jacobs beauty velvet noir major volume mascara ($26 USD) is available on marcjacobsbeauty.com and sephora.com, and is available in stores at sephora, select Marc Jacobs stores, Neiman Marcus, and Bergdorf Goodman.